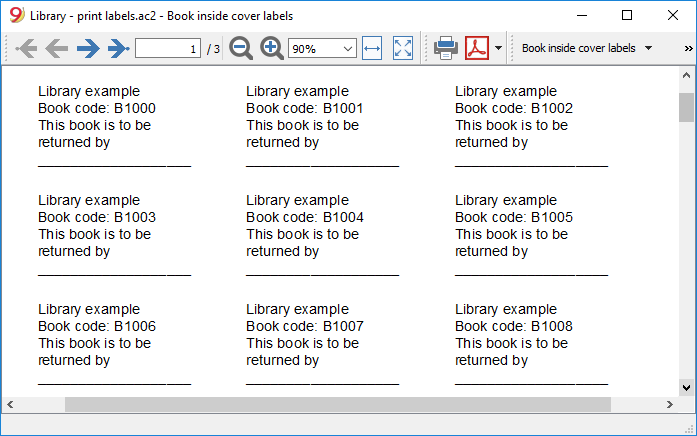 Labels can be printed either on the basis of the Banana file, where you have registered all the books in the library, or from an empty file in case you wish to print a list with codes, that you will then assign to the books. You can choose the format that best suites your needs by consulting the websites of label producers (for example A4 sheets, 25,4 mm x 10 mm - Herma 10001 or Herma 4333 models). 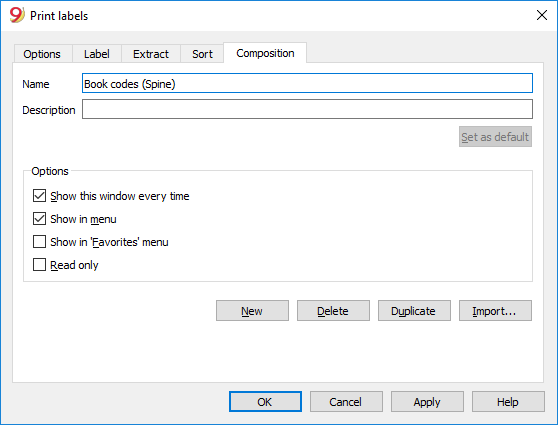 In order to print the labels, you can open a new blank file in Banana, containing no data (File menu -> New), but, as stated, you may wish to start from an existing file in your library. 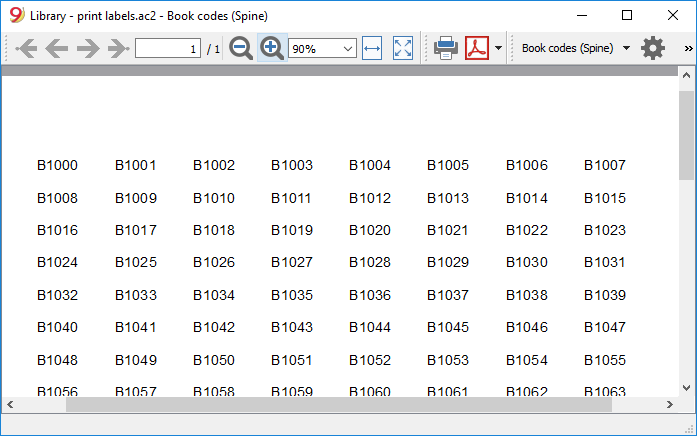 Open a new Excel file; in cell A1 entere the library code that suited your purpose (any combination of letters followed by numbers will do) - for example B1000. 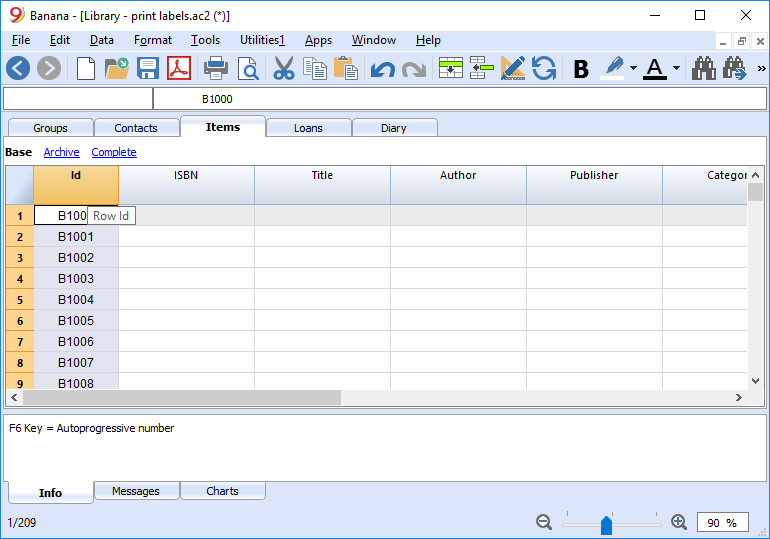 Choose the bottom right angle of your cell with your mouse (the point will now be a cross), and, while holding down the right click, drag down along the column; Excel will automatically generate autoprogressive numbers. Now copy (Ctrl + C keys) the codes that have been generated into Banana's Items table, in the Id column (Ctrl + V keys). 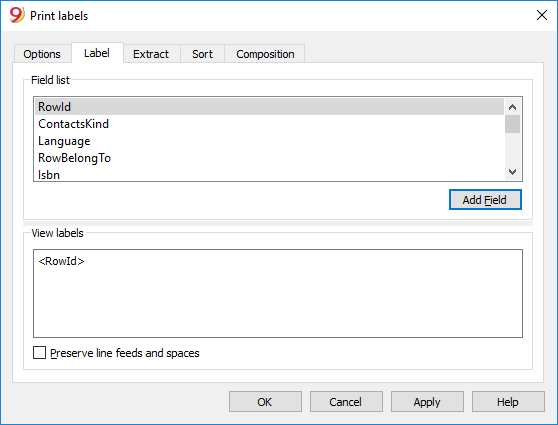 You can now create the label. 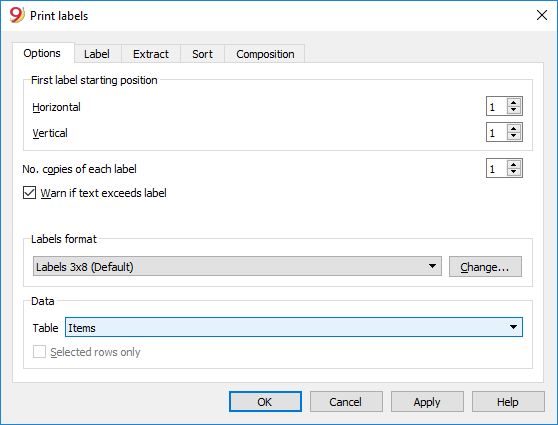 It is important to have the Items table selected as the source for Data; now you can define your label by pressing the Change... key in the Labels format section. In the window now shown, entere the margins and other characteristics of your chosen label, Herma 10001 in this case. Before hitting the OK key, opene the Composition tab, where you can assign a name to your custom settings (so they can be used in the future). In this case it's Book codes (Spine). Hitting the OK key will now return you to the Print labels window. Once you have defined the size of your label, you still need to indicate it's contents. Enter the Label tab to do so. In the example, the label only needs to indicate the book's code, i.e. the RowId column. You can therefore select the RowId line in the available list and press the Add Field button. RowId will show in View labels. Pressing the OK button will generate a preview of your label. You may now print using your Herma sheets. 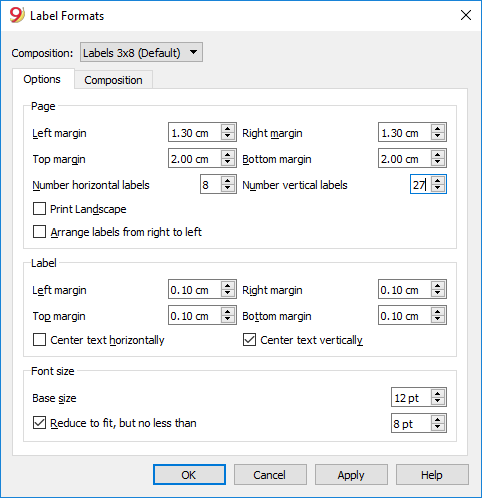 Enter the margins for your new label in Labels format window. Before hitting the OK key, open the Composition tab, where you can assign a name for your new custom settings (Inside Cover label, for example), than hit OK. 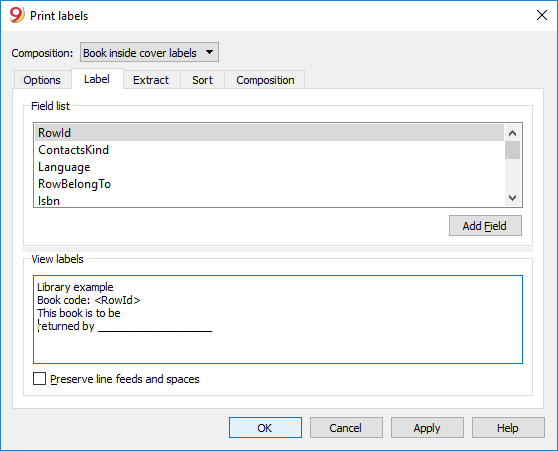 Select Label in the Print label section to add the content of your label. You may enter text, other than the available fields, as well. The models available in Banana already include the two mentioned label formats: label for the spine of the book and label for the inside of the cover. If you run a library requiring an annual membership fee, or if fees are charged for the loan of individual books, it is useful to use the accounting functions of Banana Accounting. 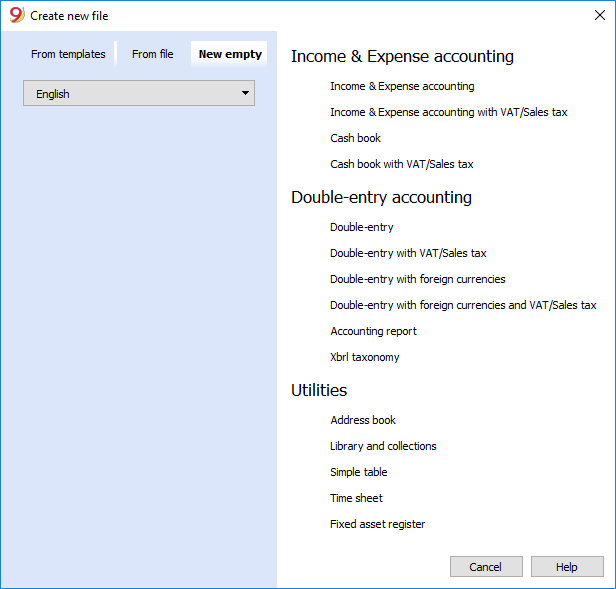 Please check our page Accounting templates.